All people using the ACT Companion Card are required to accept and adhere to the Companion Cardholder Terms and Conditions. You can present your ACT Companion Card when you are booking or purchasing your tickets from a participating Business Affiliate. The Affiliate will issue you with a second “companion ticket” for your attendant carer at no charge. The companion ticket is also exempt from all booking fees. Only the person whose name and photograph appears on the card can use the Companion Card. You may be required to show your Companion Card when purchasing or collecting tickets, or at any time during your attendance at a venue or activity. If you cannot present your card, you may be charged for the companion ticket. The companion ticket is not valid unless the cardholder is present. 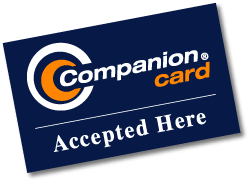 The Companion Card can be used in conjunction with any recognised concession cards held by the cardholder. If you require more than one companion, you must negotiate this with the business affiliate at the time of booking. Venue and event operators are encouraged to formally register their acceptance of the Companion Card with the program. A list of ACT venues, events and activity operators that have formally agreed to accept the Companion Card is available at the Business Affiliate List section of the ACT Companion Card Program website. Some venue or activity operators may not know about the Companion Card but may still accept your card when produced or if you tell them about the program. If a venue or activity operator needs more information, or would like to affiliate with the program, they can contact the Companion Card program via the web address and telephone number shown on the back of the card. By raising awareness in this way, it is hoped that more businesses will affiliate with the program. Please note: Acceptance of the Companion Card does not indicate that a venue/activity is accessible. Cardholders should check accessibility with the venue/activity operator before booking tickets. The success and expansion of the Companion Card is dependent upon the good will of both Cardholders and Affiliates. Attempts to use the Companion Card when a companion is not required may jeopardise the willingness of businesses to participate in the program. You should only use your Companion Card when you require the assistance of a companion to participate at a particular venue or activity. If you previously attended a venue or activity independently, this arrangement should continue, unchanged. The Companion Cardholder terms and conditions provide full details about how to use your Card. Attempts to misuse the Companion Card can result in Card cancellation. If you have a complaint about the recognition of your Companion Card, or issues about access or unfair treatment at venues or activities, you should seek to resolve this with the venue or activity management in the first instance before contacting the ACT Companion Card Program. Affiliated businesses are encouraged to develop their own complaints procedure to manage issues relating to the Companion Card.